New plant result of Russian-Iranian negotiations; Iran states they are not reporting plans to IAEA. 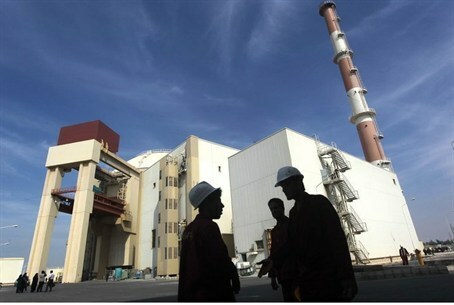 Tehran has announced that it is building a second nuclear power plant in Bushehr, Fars news agency reported Sunday. “Our first nuclear power plant is active in the (Bushehr) province which will develop, God willing,” Iranian President Hassan Rouhani said to provincial officials late Saturday. “Based on our estimates, the second nuclear power plant will be built in the same province and I hope that we can use the facilities of this province." Tasnim also notes that Rouhani referenced the recent deal signed between Iran and P5+1, stating that while tensions have eased somewhat since the controversial agreement was reached last week, Tehran's "enemies and rivals will not give up their hostility and rivalry." The Islamic Republic signed the Bushehr contract with Russia in 1995 and the nuclear power plant reached its full capacity by August 2012. The plant made headlines this summer when it experienced a critical malfunction, leading some to believe that it had been the result of a cyber attack. While Iranian officials insist that the plant is only being used for nuclear power, some Western experts have expressed concerns that the plant is capable of producing a nuclear weapon. Bushehr is one of the plants under strict supervision in the nuclear deal. However, the news is bound to anger Israeli experts and officials, who have emphasized time and time again not only that the deal legitimizes Iran's building of nuclear facilities, but also that the interim agreement will not prevent a nuclear weapon from being produced. As Fars reports, Head of the Atomic Energy Organization of Iran (AEOI) Ali Akbar Salehi stated last month that most of Iran's new power plants will be built near the country's coasts in the South and the North. “The power plants should have access to a huge source of water. The new power plants will be supported by desalinations, mainly located in Southern parts of the country,” the top Iranian nuclear official pointed out. “We are not obliged to introduce to the International Atomic Energy Agency (IAEA) the nuclear facilities that we are to build in the future and only 180 days before entry of nuclear substances there, we will inform the IAEA of them,” Salehi said. Business Standard has reported that the new plant is the result of Russian-Iranian negotiations. Russia has already agreed to resume oil trade with the Islamic Republic once sanctions have lifted; in September, Moscow denied claims that it was behind an arms deal with the Regime - and claims that it planned to promise another reactor. "We are negotiating with the Russians to produce 4,000 megawatts of electricity, and they have expressed their readiness to build," added Salehi, according to the website of state broadcaster IRIB. He said that in the next phase, Iran sought to produce 5,000 megawatts in electricity output from nuclear power. As Fars notes, Iranian officials say the Persian Gulf country needs enough atomic reactors to generate a total of 20,000 megawatts of electricity by 2020.